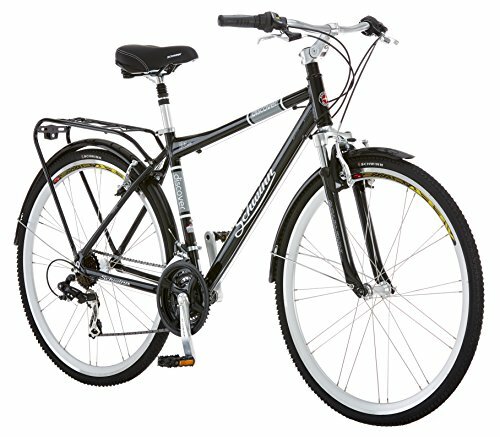 Hybrid bikes are a great way to get into cycling. They’ll give you excellent versatility at a very affordable price point. Technically speaking, they’re a hybrid between the two traditional bike types: road and mountain. Road bikes are built more for speed so you should expect a light frame, thin wheels, and bend-over handlebars. Mountain bikes are much more sturdy and are made for churning through the mud. They have much wider wheels, broader frames, and often suspension. Hybrid bikes are, unsurprisingly, somewhere in between. They’re very practical and are best used for commuting and leisure-riding when the terrain isn’t too tough. You should expect an upright seating position and moderate width tires. They are often weighted towards one use more than another, and it really depends on what you’re planning to use it for as to which model you should buy. In this article, we’ve chosen some of the best hybrid bikes and told you why we like them. We’ve explained their best features so that you can make an informed decision when purchasing. 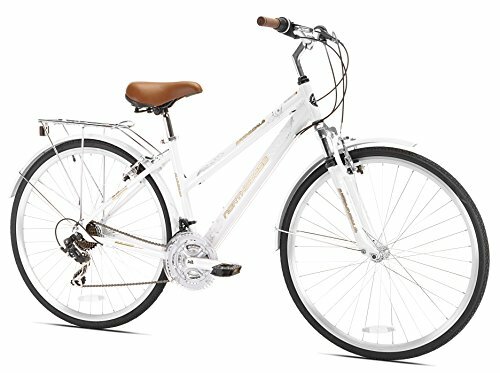 This is a very comfortable bike that comes in both men’s and women’s frame style. It is a little on the heavy side, but that’s because of those extra-comfortable features. It has a Schwinn suspension fork which means easier negotiation of curbs and potholes. The handlebars are also swept-back and have cushy grips. The seat is well padded to prevent any saddle-sore. Fenders are pre-fitted so that you won’t arrive at work covered in mud, whatever the weather. In addition, it has a built-in rack, which makes it perfect for commuting or shopping. All these features do add a little bit of extra weight (it comes in just shy of 50 pounds), but it has a 21-speed gear system meaning that you can still make it up to those hills with relative ease. Why We Like It – A great bike at an excellent price. It comes with loads of pre-fitted features which means that you can get on the road super quickly. Perfect for urban and suburban use. This is a well-designed, good-looking women’s bike. It is exceptionally good value and is a great bike to ride. The handlebars and saddle come in a matching brown, soft faux-leather. The frame is made of lightweight aluminum which makes for easier riding. Fitted linear pull brakes mean that you can make a stop with confidence, no matter the circumstances. It’s an ideal commuting bike, coming pre-fitted with fenders and rack which a pannier can be attached to. It also features a 21-speed gear system which gives it the versatility to approach different environments. Additionally, the rear stem has an alloy quick release clamp for the saddle post. This means that the height of your ride can be quickly and easily adjusted which is perfect if you’re going to share the bike with another rider. Why We Like It – An excellent choice for a first bike or for someone just getting back into cycling. It comes with all the features you’ll need for commuting and at an extremely competitive price. It’ll easily get you to work or the shops. The Wayfarer comes in a more classic design than its cousin, the Discover. It doesn’t have suspension or some of the additional features of the Discover, but this means it comes in at almost eight pounds lighter, despite having a steel frame. It’s also a bit better value. The design is attractive, vintage, and simple. Like the Discover, it has swept back handlebars, encouraging a comfortable, upright riding position. It has a built-in chainguard which looks good while protecting your trousers from getting oiled up. The saddle is padded, wide, and sprung giving you that extra comfort while riding. 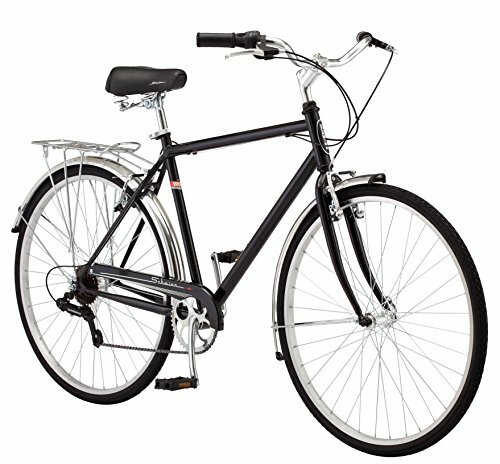 It also comes with a fitted rack and fenders, perfect for commuting in all weathers. Why We Like It – This is a simple, no-nonsense bike. There’s not much to go wrong on it, but it still has everything you need. It’ll be a joy to ride, and you’ll look good doing it. This bike is towards the more mountain bike end of hybrid. 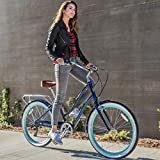 It has stripped back on some of the features like a rack and fenders, and the result is that it is the lightest of the Schwinn models at thirty-eight pounds. It has fork and seat post suspension, meaning it’ll give you that extra comfort on a rockier road. It could be used on some easier off-road tracks. 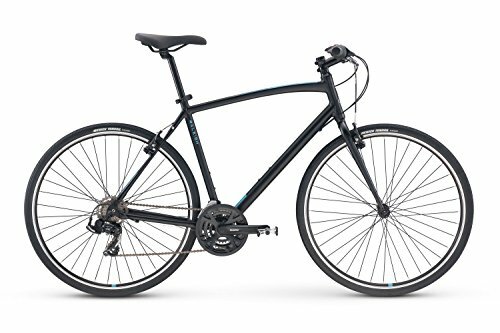 The bike features Shimano 21 speed EZ-fire shifters with a Shimano rear derailleur, meaning that you’ll get precise and reliable gear shifting. It comes in both men’s and women’s frame models. The Capital is definitely a model that can encourage your fitness more. It’s more suited to cycle path tracks than a purely commuting bike, and its reduced weight means that you’ll get power out of your leg-power. It has straight handlebars that give more control in an off-road environment. If the Schwinn Capital is more towards the mountain bike end of the spectrum, the Raleigh Cadent 1 is closer to a road bike. It comes in at an impressively lightweight 26 pounds which is something you’ll really feel when you’re out riding. It markets itself as a fitness bike which is understandable because you’re going to want to do more and more exercise once you’ve started riding this bike. 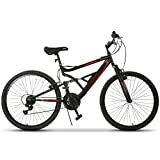 It has 700c wheels and 35c mountain bike tires which give the bike a great level of stability. Additionally, the frame has a sport geometry which encourages active pedaling without compromising on comfort. A 21-speed gear system will mean that you can handle hills easily. It comes with full rack and fender mounts, meaning it can be adapted fully for your commuting needs. The design itself is very striking, coming in a beautiful satin black. Why We Like It – This is an eye-catching hybrid bike that rides even better than it looks. It’s amazingly lightweight for the price, but the stability of the handlebars and wheels will give you the confidence to ride almost anywhere. When deciding what bike you want to buy there are a few things you should bear in mind. A lot of these things depend on how you’re going to use your bike and where you’re going to ride it. We’ve listed some of these considerations below and explained why they’re important. The heaviness of a bike should always be a big consideration in purchasing. A lightweight bike means that you’ll be able to accelerate faster and make it up hills quicker. So, if you live in a very hilly area, then you should think quite carefully about investing in a lighter weight bike. Weight can be affected by a number of things. One of the most common is to do with what the frame is made from. Steel is heavier than aluminum, for example. A heavier bike doesn’t always mean a worse bike, however. They’ll often feel more stable to ride, and if you’re not regularly climbing hills, you might not notice that much of a difference. With heavier bikes, you’re also likely to get more comfort-saving features. The suspension can come in lots of different forms on hybrid bikes. The most effective is fork suspension which will cushion your front wheel from any impact. This is especially useful as the front wheel absorbs the majority of the force as you’re riding along. The suspension is often adjustable so you can have a stiffer or softer ride. Some of the bikes listed also feature seat post suspension which gives you an additional level of cushioning to the saddle. Having suspension on your bike will make it heavier. It is worth considering the environments you ride in and whether or not it will be useful to have. If you’re riding off-road at all, the suspension might be a useful feature. If it’ll all be on well-kept roads, then it could be unnecessary. Fenders are really important if you’re planning on using your bike for commuting. The last thing you want is to arrive at work needing a shower and a change of clothes on account of all the splattered mud. Fenders can be fitted to nearly any bike but having them pre-fitted saves you time, energy, and money. It is also worth noting that they’ll be designed to match and fit your bike so you won’t have to worry about that either. Having a rack on top of the back wheel is also a really useful commuting feature. It means that you can attach a pannier and give your bike extra capacity or free yourself from having to ride with a backpack. A pannier is a great investment as they can be extremely spacious and they stop you showing up to work with a sweaty back. Again, they can be fitted to most bikes but having it pre-fitted will save you some fiddly work. Just a quick note on frame types and sizes: it is really important that you buy a frame that fits you so check the listing carefully and know what frame size you need for your height. Bikes tend to come in men’s and women’s models. Men’s frames have a horizontal crossbar, and women’s frames have a dipped crossbar. This used to be so that women could mount and ride a bike while wearing a skirt. These days, there’s nothing stopping you from riding whatever bike you see fit. Women’s bikes are a good bet for people with slightly reduced mobility as they’re easier to mount. Just make sure you’re happy with the color scheme! 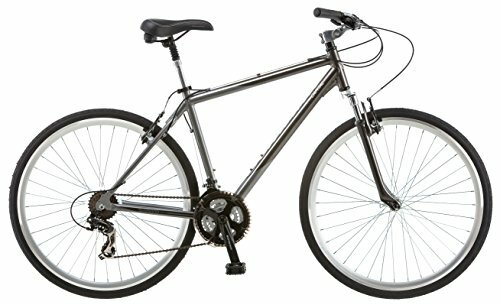 All of the bikes listed are really great versatile options for cycling. Before you buy, think specifically about what you’d like to use your bike for. If you’re going to be heading to work along flat, easy roads, then something comfortable but a bit heavier that is designed for a commuter will suit you nicely. If you plan on regularly using it for leisure riding, or if you live in a fairly hilly place then the weight of the frame is something you should be thinking about.